Remember those Lakeland baking tins of Dalek molds and suchlike we mentioned a bit back? They've been put to good use now; Edd Kimber, a winner of "The Great British Bake Off" a few years back, used one to make a Dalek cake. It's red velvet, with gold lustre dust to make the bumps. There's an official BBC recipe and everything, complete with product placement for Lakeland (we've come such a long way since the time when the BBC would marker over HP Sauce labels so no one could accuse them of swaying the audience unduly). Kimber's been talking about it rather excitedly on his Twitter, naturally enough, although not on his website for some odd reason...but seriously, just look at that cake. It looks brilliant. None of this is to be confused with the culinary creation put together by this week's failed contestant of "The Great British Bake Off", a chap called Rob who tried "constructing a Dalek out of biscuits" in his quest to build a delicious biscuit tower. It...didn't go over well with the judges. The episode's available on the BBC website, or you could just observe the bright blue Dalek and serious baking critique here. (For the record, Kibber was eating his Dalek cake Monday and the episode aired Tuesday, so there was a certain amount of coordination involved here. Maybe some BBC higher-up thought that DW would need some more positive baking-related publicity to balance out Rob's exit. Or Kibber watched the episode in advance and decided to try his hand at it. Or everyone had the same idea about making Dalek cake and the BBC coordinated them all in a clever publicity move. We'll see if any other programme finds a reason to have Dalek-shaped cake on in the next week.) Rob took it in stride, commenting that perhaps a Cybermen might have worked out better and at any rate, the crew enjoyed eating his cake. And yes, we hear you cry, everyone and their mother has tried a Dalek cake over the years (up to and including Blue Peter. Several times. No, we couldn't find the Valerie Singleton clip this week. 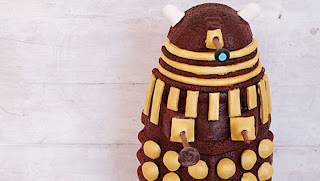 Even BBC America's done a variation, although being BBC America they aren't allowed to say they're making fairy cakes and have to settle on calling them "Mini Chocolate Dalek Cakes") So the BBC's doing a competition. Send a picture of your Dalek cake to doctorwho@bbc.com, and they'll...post it on their Facebook. If they think it's good enough. Not very exciting, is it? You'd reckon that with a souffle-making companion they'd be having a competition for "the recipe Clara uses to save the universe!" or something. Still, it is as good a way as any to remind people that GBBO exists and is halfway through its fourth season right now, so mission accomplished.